Knitting is fun and relaxing and I knit for friends and family, anything from scarves to slightly odd things like a Zombie. 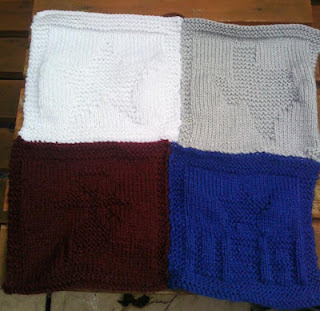 The picture above is the front of a cushion I knitted for my friend Mike in Texas. He was a Marine so even though it does not show up well in the photo the image on the maroon square is that of the Marine logo.The Texas star is next to the map of Texas and the blue square has U.S.A on it with a star above it. Making something that has meaning to the person makes the gift extra special. I taught myself to knit and still consider myself a novice, I knit simple easy to follow patterns nothing too fiddly as I get lost when trying to count the stitches. Knitting is a hobby and I love using up all the scrap yarn I have left over from various projects. Knitting for Charities is fun and you get to give something to others as well, there are plenty of charities to knit for from animals to adults and they all appreciate what you do for them. Scrap yarn can make colourful hats, toys and blankets so you never waste the yarn left over from your other projects. So never think you have to go out and buy in yarn to make something special be creative and use colours that you have. Toys are great fun to make and you can be as creative as you like with bright colours as children them. Both the Pocket Baby and Topsy Turvy Anna went to charities and were very quickly sold.